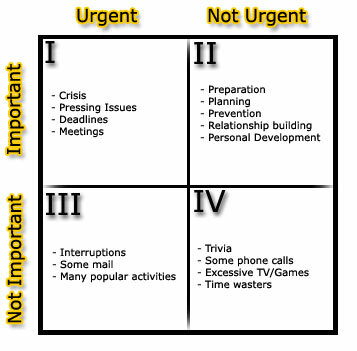 Ideally, the majority of time spent should be in Quad II. Processing, planning, preparing, personal development, prelationships (ok, that one doesn’t start w/ p, but I was on a roll). In my defense, I have done a LOT of reading so far this year. I’ve read 3 non fiction books, and am finishing up the 2nd fiction book, plus 39.5% of the bible (according to my YouVersion.com reading plan). All well and good, but, to be productive there has to be some output, right? Time spent thinking about what I’ve read, planning to apply it, and thoroughly processing it. Wow, hopefully I have a LOT more years to live, because I’m awfully slow to figure all this stuff out. One day, I aspire to be really really smart. and productive. whatever that means… Maybe by the time I’m 90 something, I’ll have it all together. Many times you are right where I am mentally Cari. I really want to get hold of things and stop frittering life away but I am not a quadrant 2 type so I can’t seem to plan my way out! I’ve never heard of this category system but I have really been feeling like getting proactive about my health AND God’s plans for me this week. I know he never meant for me to sleep so much!